Where many hopes were born. When they go to church to pray. Help us keep our freedom this way. I hear God's ringing call. Bringing hope and joy for all. The history of St. Paul’s Church is unique to any other Episcopal church in all of America, for it is known as “The Birthplace of the Episcopacy in America.” It was here in Woodbury, at Glebe House in 1783, that Samuel Seabury was elected the first Bishop of Connecticut and of the American Protestant Episcopal Church. This fascinating story has ever since given Woodbury a singular place in Episcopal Church history. 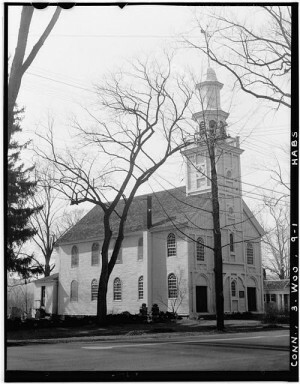 The Episcopal Church arrived in Woodbury in 1740, but its significance was truly established in 1771, upon the arrival of the church’s first resident rector, John Rutgers Marshall, a most propitious choice considering the extreme difficulties of those troubled pre-American Revolution times. All of the Episcopal Church’s New England clergy were considered Tories and treated as such, with John Marshall even suffering physical abuse and house arrest. Despite all this, Marshall trod a truly patriotic path. With the conclusion of the War for Independence, Marshall turned his enormous spiritual and intellectual energies to the growth of St. Paul’s Church and especially the American Episcopacy. Most notably, he addressed the need for an American Bishop, without whom neither confirmation nor ordination could be had in this land. John Marshall’s natural gift of leadership became a force in this matter. At Marshall’s invitation, ten Episcopal clergymen convened in secret on March 25, 1783, at Glebe House in Woodbury (Marshall’s home). There they elected the Rev. 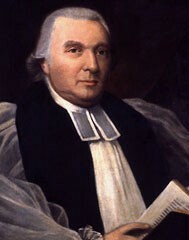 Samuel Seabury as the first Bishop of Connecticut and of the American Episcopal Church. It is this “Convention of the Immortal Ten” which established the basic organization of the Protestant Episcopal Church in America, the certainty of Apostolic Succession and, thanks to Bishop Seabury’s influence, the organization of the House of Bishops. Two months later, Seabury sailed for England to be consecrated. However, as a now-loyal American, he could not take the prerequisite oath of allegiance to King George, making consecration by the Archbishop of Canterbury impossible. Since the Scottish bishops carried on independently of Canterbury, Seabury accepted their invitation for consecration at St. Andrew’s Cathedral in Aberdeen, seat of the Diocese of Aberdeen and Orkney. Over a year later, on November 14, 1784, Samuel Seabury was at last consecrated as Bishop of Connecticut and the American Episcopal Church. Thus are Woodbury, St. Paul’s and Glebe House to the National Episcopal Church what Philadelphia and Independence Hall are to the Nation. By the early 1780’s, secular and religious peace had come to America, and John Marshall’s little Episcopal congregation felt ready to construct its own church building, having always held its services in other church’s meeting houses. 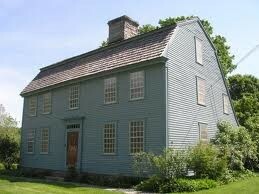 Begun April 1, 1785, the building was fully constructed and enclosed by June 1, 1786, but funds were exhausted. Therefore, in August, 1786, Glebe House was sold, and the proceeds of that sale were used to finish the interior of the church. In November, 1787, the first service was held in St. Paul’s Church. 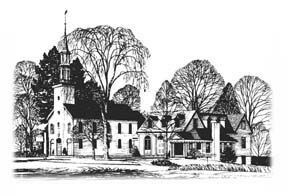 In 1784 the Woodbury Town Authority gave permission to the “Episcopal Society of Woodbury” to build a church aside the “Burying Ground.” The main portion of the church as it is today held its first service in November, 1787. But it was 1822 before the building was fully complete and consecrated. In 1961, a new parish house was attached to the church. The land under the parish house had belonged to the Town of Woodbury, which sold the property to the church in 1959 for $1.00. Because of Samuel Seabury, there has been a consistent 230+ year history of exchange visits between the Bishop of Aberdeen and Orkney in Scotland and Woodbury. The Rev. Earl Estabrook, rector of St. Paul's from 1961 to 1976 and president of the Seabury Society for many years, reinvigorated St. Paul's ties to the Cathedral of Aberdeen and the importance of that history by visiting Scotland extensively during his tenure with us. He established a very close relationship with the Rt. Rev. Frederick Darwent, Bishop of Aberdeen and Orkney. As a result of this involvement, Rev. Estabrook was appointed Canon of the Cathedral of Aberdeen from 1971 to 1978, and Honorary Canon from his retirement until his death in 1990. There were several wonderful exchanges when Bishop Darwent and his wife came to Woodbury for extended visits. From this also grew a close relationship with the Rev. Gerald Stranrear-Mull, then vicar of two sister-churches in the Diocese of Aberdeen and Orkney, St. Mary-on-the-Rock in Ellon, and St. James the Less in Cruden Bay. Over the past 20 years there have been numerous pulpit exchange and parishioner exchange visits between St. Paul's and St. Mary's and St. James. Upon the 200th anniversary of Samuel Seabury's election as Bishop in 1783, our then rector, the Rev. J. Douglas Wigner, was asked by the Diocese of Connecticut to organize and direct a commemorative ceremony to be held on March 25, 1983. The people of St. Paul's rallied to the cause. They transformed Woodbury's Nonnewaug High School into a veritable church for this memorable event. The Rt. Rev. Frederick C. Darwent, Bishop of Aberdeen and Orkney, traveled from Scotland to be the celebrant, and bishops, priests and lay people from throughout the Diocese came to attend this historical celebration. It concluded with all participants walking from the high school to St. Paul's. The group was led by Father Wigner and several other parishioners who shared in carrying a rough wooden cross to the church on Main Street South. There they were greeted by bagpipers in full Scottish garb. It was indeed a singular event in the life of our parish. The most recent Scottish visit occurred in 2007, when the Rt. Rev. Robert Gillies came to Connecticut to attend the consecration of Bishop Suffragan Laura Ahrens. That visit continued a tradition of almost 200 years -- whenever a bishop in the Diocese of Connecticut or a bishop of Aberdeen and Orkney is consecrated, a representative from one goes to honor the other. Just two weeks later, our then rector, the Rev. Dr. James R. Wheeler, traveled to St. Andrew's Cathedral in Aberdeen to represent the Diocese of Connecticut at Rev. Gillies' consecration as the new Bishop of Aberdeen and Orkney. We hope that our new rector will treasure this tradition and strive to keep it alive. Thus has our history reached the year 2018, with the happy welcome of a new rector, the Rev. Tuesday Rupp. We are a parish very strong in the Holy Spirit, with a deep fellowship of Christian love for each other and joy in service together. We eagerly await an era of renewal and growth and new life in our Lord. The St. Paul's community cherishes its history and traditions. We joyfully and respectfully blend the old with the new.